Grégoire joined Quilvest in 2007. He works on the due diligence of direct investments and private equity funds primarily in Europe. He also participates in the monitoring and reporting of QS PEP. Prior to that, Gregoire worked in mergers and acquisitions, notably at Deloitte and Crédit Agricole where he was involved in the execution of transactions in the service industry and manufacturing sector. He also has a previous experience in audit and financial controlling. 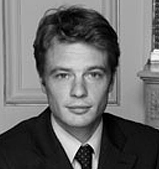 He graduated from La Sorbonne (MSG) and holds a master in financial engineering from ESLSCA, awarded with honors.